You are eligible for FREE Birchwood Roadside Assistance coverage for up to 3 years with any tire purchase at the Birchwood Automotive Group. * We also offer this same coverage FREE for 6 months following your service at any Birchwood dealership. When out on the road, you'll know that you are protected by an organization that cares about the safety of you and your family. Our customer service representatives respond quickly to provide you the best service and protection available anywhere. What does Birchwood Roadside Assistance offer? You are covered for emergency road service throughout Canada and the United States. We will tow you up to 80 km to the nearest Birchwood Automotive Dealership or up to 8 km to the nearest service station. Extended distance will be an additional expense. You will be provided with any service requiring minor adjustments (exclusive of parts) to enable a disabled vehicle to proceed under its own power, where available. You may have your tire changed with your inflated and functional spare tire. A service truck will deliver emergency supplies of gasoline, water, oil, or other necessary supplies. You will only pay for the cost of the supplies. If keys are locked inside your vehicle, you will be assisted in gaining entry to the vehicle's passenger compartment only. Locksmith services may be dispatched as needed at your expense for labour and key making. You are entitled to take advantage of our rental car discount codes and pre-negotiated group rates which are honored at thousands of locations throughout Canada and abroad. We will, at no charge, provide you with four-colour mapping and travel route information. Whenever you travel, you'll enjoy the secure and confident feeling of knowing that you are protected by Birchwood Roadside Assistance. 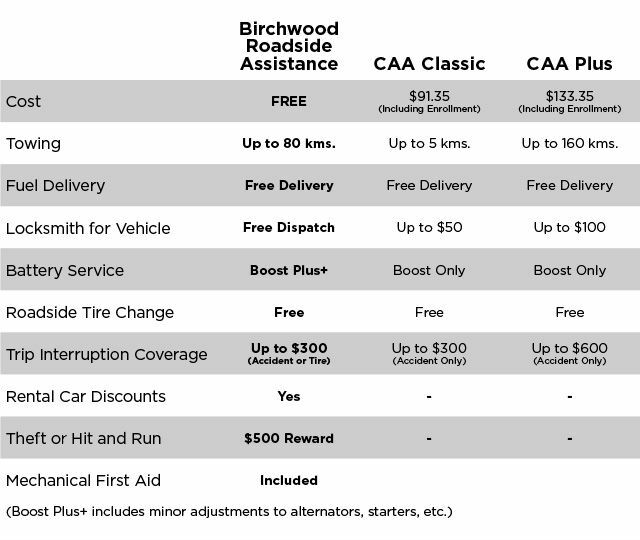 How does Birchwood Roadside Assistance differ from CAA? *Some conditions and exclusions may apply such as run flat tires, z-rated tires, and tires over 19". See in store for details.